The tranquil seaside waters of Villa Ambalama welcome guests to embrace the panoramic oceanview. Villa Ambalama lives up to its name, resting place, when translated. It is a hidden island haven! Completely silenced out from the noise of traffic, guests are spoiled with sounds of bustling leaves against the easy breeze. The 4-bedroom setting embraces warm golden tones and an alfresco veranda. Across pavilions, 4-ensuite bedrooms are found. It is complete with wooden-panelled enclosures, a carefully thawed Cogon-grass roof, and four-poster beds draped in chiffon fabric. The suites open to its own terrace and the stunning seaview panorama. Air-conditioning and ceiling fan facilities are present to cool the hottest tropical day. Nonetheless short of primitively extravagant, immaculate rugs, in-room seating arrangements are inclusive. The spacious, sunlit en-suite bathrooms feature high-ceilings, twin vanities, and rain-shower facilities. The private pool stretches along the freshly manicured gardens. 13 meters of glistening water under the tropical sun is accompanied by a casual dining area and sun loungers on either side. To add cooler tones to the golden ambiance of the space, teal cushions deck out the furnishings. The gardens are freshly manicured by your own housekeeping staff and gardener. The middle section of the garden can be a perfect venue to host garden parties or a small BBQ get together. Additionally, an alfresco pavilion hosting a veranda-styled seating space is featured. The plush mattresses enclose a humble table perfect for tea, sips of juices or to crack a cold one. 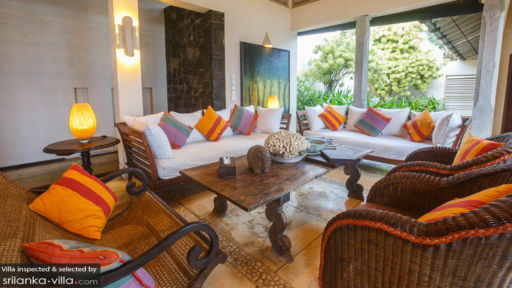 A larger living area is placed as the focal point of a central pavilion - the golden-toned space is decked out in traditionally-woven sofas, generous amounts of cushions, a low-lying coffee table, and a collection of bronze statement pieces. All of which are located under a thatched-ceiling and pearly-white fans. The central living room is enclosed with wooden-panels that open into the panoramic oceanview. A second living area nestles the round dining table that seats 8. The space is completed with a stone-sculpture of a horse and vibrant florals. A large team of staff is ready to spoil guests of Villa Ambalama with five-star help. A villa manager and assistant manager, a private chef, villa attendants, gardeners, a pool attendant, and 24 hour security guards, guests will not need to worry about keeping the mansion at tip-top shape! A small extra charge is added if masseuse and babysitters are requested. Tucked far away from the hustle and bustle of the city centers, the villa offers perfect proximity for guests to indulge in the sunrise views of Rumassala MountainKoko’s On The Beach, or perhaps go Luna Terrace to grab a cocktail or two. Spa-hop to the famous Amangalla to have a session of detoxifying body scrub, followed by a herbal or milk bath. Fabulous location, beautiful setting, lovely villa. Very clean, staff is very friendly. The highlight is roshans food. We went out a couple of times but in the end concluded that the food in the villa was the best. He has great hands. Must stay at ambalama. Highly recommend it. 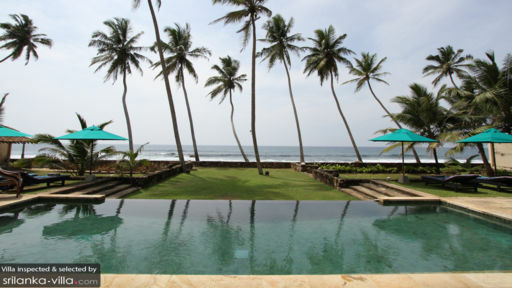 My wife and I spent 6 days with 2 friends at this wonderful luxury villa near Galle, Sri Lanka. 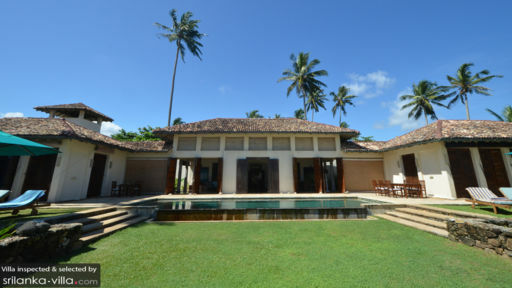 In short, if you want relaxation, superb setting on the beach, an exquisite luxury villa, exceptional food, amazing sunsets, setting to die for, and unobtrusive and friendly Sri Lankan hospitality then don't hesitate to book Ambalama! You won't be disappointed! A return visit with my wife a year on but this time accompanied by her mother and aunt. Wow, our fantastic memories from last year didn't fail us. The staff are fantastic, the food amazing, the service impeccable and the location and views.......well, absolutely breathtaking! We were blessed with great weather and had the whole spacious villa to ourselves. My family (2 adults and 3 children) stayed at Ambalama for 3 nights at the beginning of October. We simply loved the villa. We had a wonderfully relaxing stay and were superbly looked after by the wonderful staff. After the marvellous experience of last year,I knew what to expect in terms of the amazing proximity of the sea, the sunset views, the sound of the waves as you fall asleep. The food was excelent in 2014 but has gotten even better I think and the chef is game to execute requests and does so with panache and imagination. We had the good fortune to witness turtles clambering up the beach to lay their eggs. What an experience! The staff were super friendly and remembered us from the first visit, giving an extra glow to the hospitality and service. I cannot imagine a better place to relax in a sophisticated environment, so close to the sea, but with the luxury of respectful and super friendly service. I hope to return before long!